After the Easter egg hunt is done, the ham has been served, and the ears have been bitten off the bunnies, you may find yourself making excessive amounts of egg salad and facing a giant pile of eggshells. But don't throw them out! Because the shells are an organic material packed with calcium and a perfectly abrasive texture, they have lots of benefits that you can tap into for plenty of helpful uses at home. 1. BOOST YOUR TOMATO PLANTS. Easter means the summer growing season is not far off, and if you're industrious, you might already be growing some seedlings to get a jump on things. When you plant or pot your tomato plants, put some eggshells at the bottom of the hole or the pot. The shells are loaded with calcium and can help protect your tomatoes from calcium deficiency, which causes blossom-end rot. 2. MAKE YOUR OWN HOUSEHOLD CLEANER. 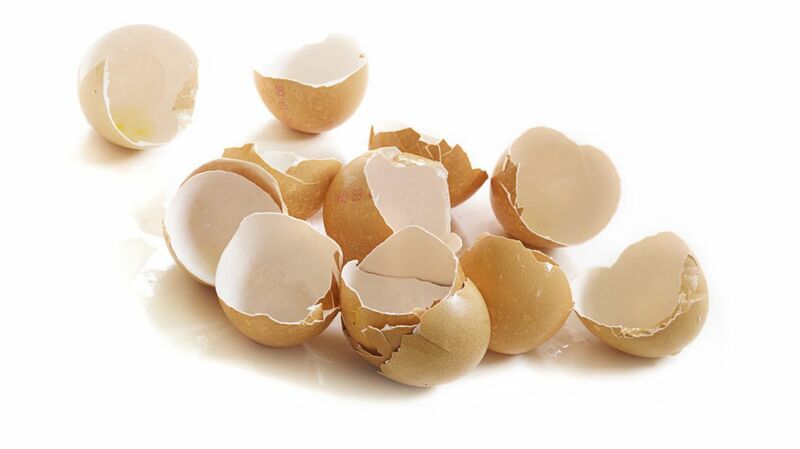 Eggshells are naturally abrasive but don’t contain the toxic chemicals you find in store-bought cleaners. Because of this, they make for a great multi-purpose householder cleaner. For this use, be sure to use eggshells from your deviled egg platter that have not been dyed (it’s OK to use those with stickers if you peel them off). Dry the eggshells completely and then pulverize them in a food processor. Mix them with baking soda in a 1:3 ratio (for example,1 tablespoon of eggshells to 3 tablespoons baking soda) and add water to moisten the mixture. This is a great way to scrub your stovetop, pots, counter, or water stains from your shower. Dry and pulverize the shells and sprinkle a quarter teaspoon of the powder into the kitchen sink when you drain it after washing dishes. The abrasive egg powder will cling to the bits of food in your pipes and turn into little scrubbers as they move through the pipes. This will help reduce build-up throughout your plumbing. 4. MELLOW OUT YOUR COFFEE. Make sure your eggshells are clean and do not contain any of the egg membrane (and only use plain shells or those decorated with natural food coloring). Put some of the eggshells in your coffee grounds when you add them to your coffee maker. Eggshells are mostly calcium, which is alkaline, and can absorb some of the acid in the coffee, giving it a mellower flavor. In fact, one test found that stirring some eggshells in a cup of over-brewed coffee also improved the taste. 5. USE INSTEAD OF A BOTTLE BRUSH. If you have a vase with those annoying, impossible-to-reach water marks on the inside, drop some crushed eggshells into the vase with a little bit of warm water and a drop of dish soap. Swirl the mixture around, and the abrasive shells will scrub off the water marks and rinse right out. If you’re agile enough to keep roughly half of an eggshell intact, it makes the perfect container for starting seedlings. Place the shells in an empty egg container (or spruce things up with one of the pretty ceramic egg crates that are popular). Partially fill the shells with dirt and plant the seedlings. When it’s time to transplant them, you can just put the whole shell right into the ground since it is biodegradable and will add to the calcium in the soil (but give the shell a crack on the bottom before planting so the roots don't have any problems getting through). 7. GET RID OF GARDEN PESTS. Diatomaceous earth is often used in gardens to control beetles, slugs, roaches, and other pests. This natural product is basically ground up fossils, which is an abrasive material that irritates, dries out, and eventually kills the bugs. Leftover eggshells can create the same effect. Pulverize them and sprinkle directly on the pests, their nests, or around the leaves or base of your plants to help control pest attacks. 8. SCARE AWAY STRAY CATS. If stray or neighborhood cats are using your garden to relieve themselves (or are taunting your dogs by tiptoeing through your yard), spread some roughly crushed eggshells around the area the cats are frequenting. Cats don’t like the crunchy, sharp feel of the shells on their paws, and will learn to avoid that area. 9. REPLACE ANY MICROBEAD CLEANSERS. Beauty products with microbeads can no longer be produced after July 2017, when a law signed by President Obama in late 2015 goes into effect. Microbeads are great for exfoliation, but it turns out the tiny bits of plastic are damaging to the environment, particularly to fish, who ingest them. Eggshells, however, are a great, environmentally friendly alternative. Use plain eggshells without coloring; dry and pulverize the shells, and mix with an egg white. This can be used as an exfoliating cleanser or as a face mask. 10. ADD TO YOUR BIRDSEED. Wild birds at your feeder will benefit if you add lightly crushed eggshells to the bird seed. Be sure to use shells that are plain or have only been colored with natural food coloring and have been completely dried (baking the shells at 250°F for about 10 minutes will do the trick). Female birds, who may be calcium deficient after laying their own eggs, will get a boost from this addition to the food. You can also gently crumble the shells and spread them on the ground for the birds if you don’t have a feeder. If you’ve got mugs stained from coffee and tea, eggshells can help return them to their original color. Crush the shells and place them in the mug with a little water and let it sit overnight. The porous shells will absorb the stain and leave your mugs clean without any crazy scrubbing on your part. 12. MAKE AN INEXPENSIVE CALCIUM SUPPLEMENT. Plain or naturally colored eggshells can save you money on your calcium supplements. Studies have found that ground eggshells make a good substitute for manufactured calcium supplements (and in some cases might even be better). One eggshell contains about two grams of calcium, which is twice the recommended daily intake for adults. Rather than having your omelette with a side of shell though, you can add finely ground eggshells to any variety of food that you cook, like pizza or pasta. You can also mix ground shells into your dog or cat's meal as a calcium supplement.